How do SCP Products Reduce Drying Shrinkage? SCP Tech Brief: How Do SCP Products Reduce Drying Shrinkage of Concrete? One of the issues facing conventional concrete is that concrete shrinks. This mechanism of volume change can lead to cracking of the concrete structure. Concrete shrinkage is in response to the loss of water that is held in the pore space of the concrete. This process is known as drying shrinkage. “Pore space” or “pores” refer to the voids that are formed as concrete is made and hardens. This space is made up of bleed water channels, capillaries, entrapped air voids, and other naturally-occurring voids. 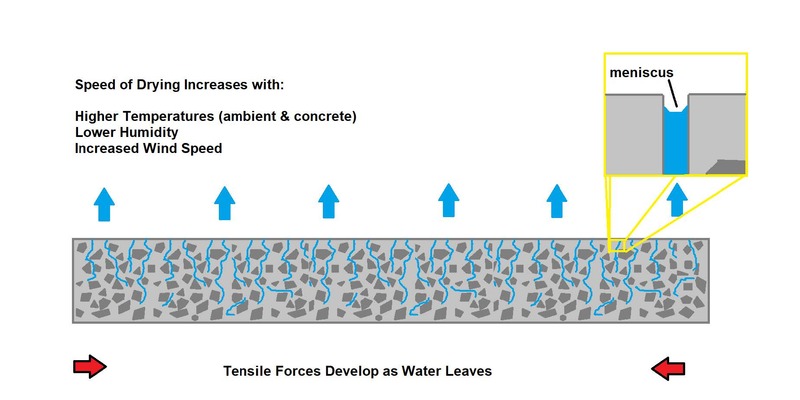 When pores are interconnected, they provide a pathway for water and water vapor to pass through the concrete to then evaporate once they make it to the air above the concrete. This process, though most noticeable during the first twenty-four (24) hours or so, continues for several days, weeks, months, or in the case of mass concrete, maybe even years. In fact, some of the water, known as non-evaporable water, never leaves concrete because it is trapped within the structure. Though often referred to simply as “water”, the liquid within the pore structure of concrete is more accurately referred to as “pore solution” because of the presence of various ions and salts dissolved or suspended in it. Given a constant composition of pore solution the rate of drying shrinkage is most dependent on the evaporation rate. Evaporation rate is determined by ambient temperature, concrete temperature, relative humidity, and wind speed. In general, greater winds and temperatures and lower humidity lead to faster moisture loss in concrete. When drying occurs more quickly than the tensile capacity (the ability of the concrete to withstand “pulling apart” forces) of the concrete develops it can lead to drying shrinkage cracks. Maintaining moisture levels for an extended period is vitally important to concrete and is the basis of the idea of “curing” along with maintaining proper temperatures. The goal of curing is to slow the rate of drying and provide a continued supply of water for the hydration of cementitious materials to continue. An important consideration in concrete technology is the difference between “drying” and “curing”. These terms are often incorrectly treated as interchangeable, especially in reference to concrete that will receive flooring materials. Drying refers to the loss of moisture over time from the concrete, while curing refers to the intentional act of holding moisture in the concrete to facilitate continuation of the cement hydration process. While most flooring and adhesives manufacturers require the concrete to be below a certain percent moisture or relative humidity to function properly, they are really concerned about the moisture present at the interface between the concrete and the adhesive and/or flooring. In concrete not treated with Spray-Lock Concrete Protection (SCP) products, a general moisture condition of the concrete determination is sufficient to describe the entire system. SCP products react with available alkalis to close bleed water channels and capillaries with reaction products. This action holds moisture in the concrete to facilitate curing. The surface of the concrete is able to achieve a “dry” condition and able to receive adhesives and flooring while the concrete’s internal structure is kept at a high level of moisture conducive to continued curing. 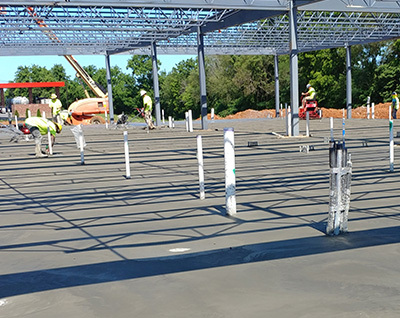 A description of the entire system based on a total percent moisture or relative humidity is no longer appropriate when using SCP products because the water and water vapor transport mechanisms are significantly affected, allowing the surface of the concrete to act independently of the total slab moisture content. where σcap is pore pressure, γ is the surface tension of the pore fluid in lb/in. (N/m), θ(rad) is the contact angle between pore fluid and solids, and r is the radius of the menisci in inches (m). From the equation, it can be observed that the pore pressure increases as pore diameter (meniscus radius) decreases. This pore pressure is identified as the prevailing force by which drying shrinkage occurs – the pressure pulls on the pore walls. By reducing the surface tension of the pore fluid (γ) and the corresponding reductions that occur in the contact angle (θ), it is possible to reduce the pressure that is generated. SCP products reduce drying shrinkage in two main ways. First, the SCP product is applied to the surface of the concrete shortly after finishing operations are completed. SCP products are primarily made of colloidal silica consisting of very small silicon dioxide particles suspended in water. The colloidal silica enters the concrete through bleed water channels and capillaries, penetrating deeply and combining with some of the existing pore solution. Introducing a solute or suspension to water is the most straightforward way of changing the water’s surface tension. By introducing suspended silica particles into the pore solution, treatment with SCP products should change the pore solution’s surface tension and contact angle, thus reducing the pore pressure. Secondly, the SCP particles then react with alkalis in the concrete to close pores off by primarily forming calcium silicate hydrate (C-S-H). This pozzolanic reaction results in making the pore structure less continuous and significantly reducing the transport of water through the concrete. This action holds in water that normally would be allowed to evaporate without SCP treatment, slowing the rate of drying significantly. This combination of changing the chemistry of the pore solution and then closing off liquid transport combines to significantly reduce drying shrinkage of concrete. Testing has demonstrated a typical decrease of 40% to 60% of drying shrinkage at 28 days of SCP-treated concrete compared to controls. https://concreteprotection.com/wp-content/uploads/2018/08/TechBrief_DryingShrinkage.jpg 318 400 admin http://vps30932.inmotionhosting.com/~sprayl6/wp-content/uploads/2013/04/SCP-Logo1-300x136.jpg admin2018-08-20 02:48:082018-11-19 23:57:59How do SCP Products Reduce Drying Shrinkage?